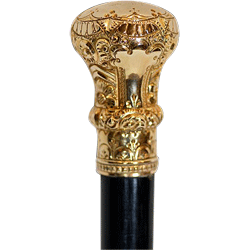 Antique canes and walking sticks are about so much more than you can imagine. The golden era of canes is from 1550 to 1930. Most people think that canes and walking sticks were used for the purpose of supporting people; however that couldn’t be further from the truth. Canes were a reflection of the culture and a lady and gentleman never went anywhere without one. Canes were made of ivory, porcelain, enamel, gold, silver, hand carved wood, glass, narwhal tusk, Bakelite, whale bone, rhino horn, ebony, snake wood, Wedgwood, gemstones just to name a few. There were 1500 patents for gadget canes in America alone. There are gadget gun canes, sword canes, musical, political, Doctor, compact, perfume, flask, picnic, microscope, fishing pole, scientific instrument, pipe, cigarette holder, vinaigrette, barometer, undertaker, and horse measure. Name an occupation and there is probably a walking stick to represent it.